WHICH WORKTOP SHOULD YOU CHOOSE? Choosing the right worktop for your kitchen is very important. Rightside Kitchens will provide detailed advice on the options that will best suit your individual needs and budget. The following information will give you an idea of the various types of worksurfaces we can supply and fit. Hardwoods have a unique natural beauty quite unlike any other material. Visually highly versatile, hardwood worktops complement a wide range of contemporary and traditional kitchen designs. They're hard-wearing and practical. 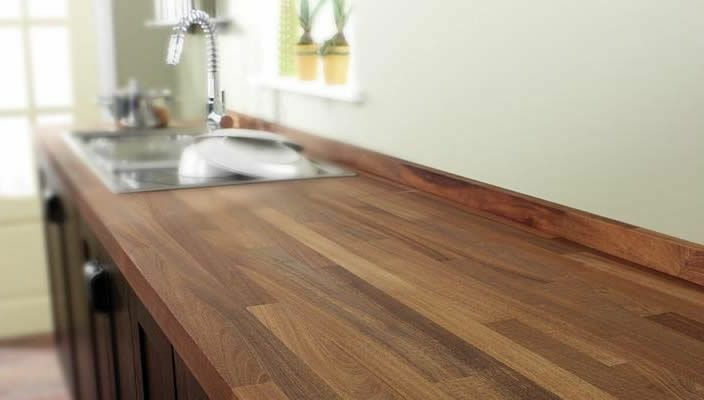 As well as being naturally durable, hardwood worktops are easily restored to their original beauty following the bumps and scrapes of everyday life in the kitchen. Scratches and water stains can be gently sanded out and the surface re-oiled to restore a pristine finish. Spillages can be simply wiped away, especially if the worktop has been regularly treated with Danish Oil, giving it a waterproof surface. Many different woods and colours are available. Iroko, the hardwood typically used in dock structures, is highly resistant to water, making it ideal for use in parts of the kitchen typically exposed to splashing, such as the sink area. Rightside Kitchens can advise on the pros and cons of the various options. A completely natural material available in a wide range of colours and thicknesses, granite sets the standard for worktops. Granite worktops, whether in high gloss or honed matt finish, are low maintenance, hard-wearing and resistant to scratching and chipping. They complement both traditional and contemporary kitchens. 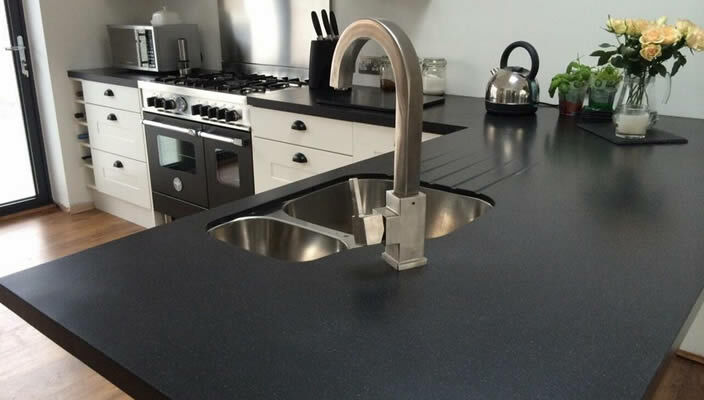 Made entirely of solid granite, these worktops are among the heaviest on the market. - a 2.6m length of standard 30mm granite worktop weighs some 23 stone ! 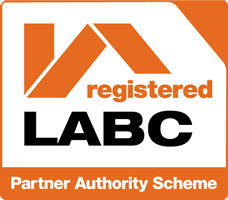 Colour variation – a feature of the natural granite – does occur, especially in medium and light coloured worktops. Rightside Kitchens will advise on these and any other matters concerning your worktops. Granite worktops can be used to outstanding effect anywhere in the kitchen, including the sink, hob and oven areas. They can be cut to a wide variety of shapes and sizes to suit your kitchen's particular design needs. Rightside Kitchens always seal granite worktops after installation, providing additional protection against spillages that could cause stains. Corian® is a synthetic material, approximately 70% crushed stone and 30% acrylic resin and colouring. The resin gives it a warmer feel than granite, and also allows it to be moulded and formed into an almost limitless range of curved shapes, including fully integrated sinks and drainers. 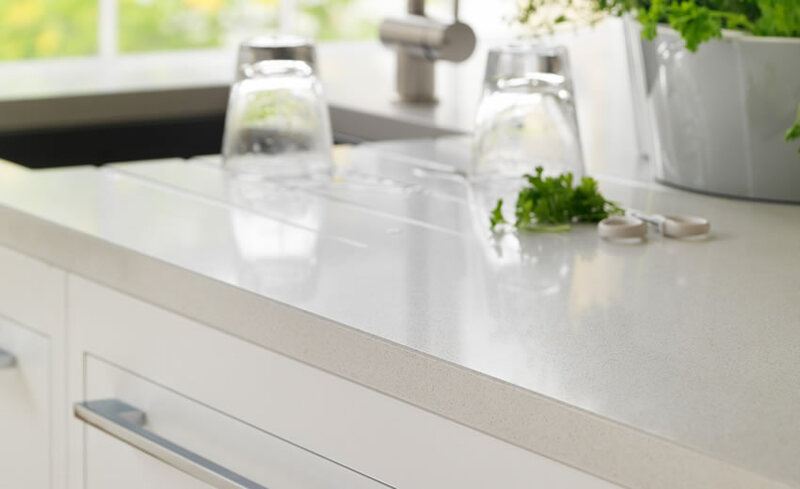 With seamless joints, Corian® worktops are smooth, hygienic and easy to keep clean. Constructed as a 13mm solid surface moulded over an MDF frame, they are lighter than comparable stone worktops, but durable and easy to repair. Scratches and stains can be removed with light sanding or polishing, and even more serious chips can be repaired to an 'as new' standard. All Corian® worktops come complete with a full care and maintenance kit, but general care involves nothing more than a damp cloth and a mild detergent. Corian's® capacity for moulding and forming and its availablility in over 100 different colours makes it suitable for use in design features that rule out other types of worktop – the possibilities are virtually limitless. Rightside Kitchens can advise on how Corian® worktops can bring your kitchen design to life. 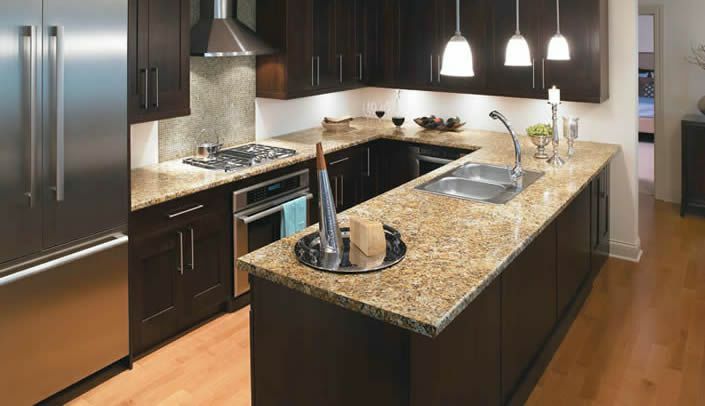 Traditionally, one of the top sellers and most sought after kitchen worktop materials has been granite. Over the last ten or so years though, another contender has been hot on its heels – composite stone. Composites are a type of man-made material and they come in a huge range of styles and colours. You may have heard them referred to as engineered worktops; or quartz worktops. Whether they are known as engineered, quartz or composite worktops, they are all produced in much the same way. Quartz is one of the world's most abundant resources and can be found either in a pure form or as part of another compound. 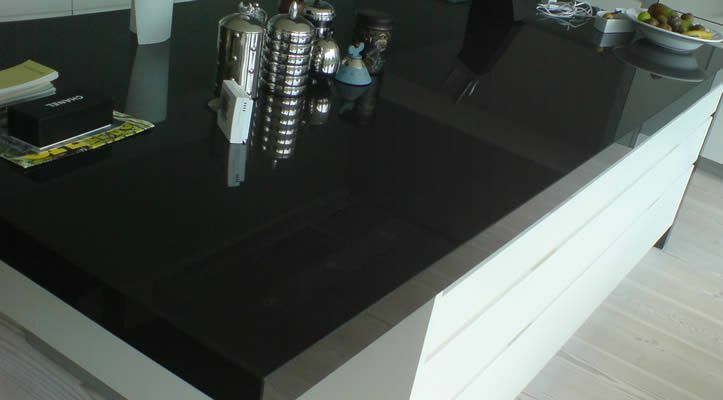 Due to its extreme hardness and resistance to acids, quartz forms the main component of composite kitchen worktops. The quartz is ground down (the size of which can be used to give the worktop a finer or coarser look for its final appearance) then combined with a high-quality resin to form the composite worktops. By adding dyes to the mixture and altering the size of the grains, there is an almost endless range of shades, colours and styles available. The biggest advantage of laminate (also known as 'post formed') worktops is their attractive pricing. Manufactured by bonding a thin layer of synthetic 'laminate' material to a solid chipboard or MDF base, these worktops rely on modern photographic techniques to mimic almost any other surface type. Choose from slate, granite, quartz, wood or any of a wide range of other looks. Laminate worktops are not as durable or robust as Corian®, Zodiaq®, granite, and other surfaces, but still offer a good finish and long life when installed and cared for correctly. Naturally, all of Rightside Kitchens' laminate worktops are manufactured to the highest standards and fitted with great care.